Walking down to the river everyday, in the heart of winter mind you, hoping, praying, darn near begging that one skwalla nymph will crawl up to me from under one of the twenty rocks I've rolled over and say, "get ready, spring is almost here". Is that to much to ask? OK, so skwalla nymphs can't talk, and maybe I'm writing about a past fishing dream or something, but if they could they would certainly tell you that soon, very soon, they will be on the move towards the banks of our rivers here in western Montana. 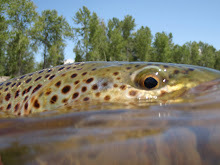 The Dry Fly Bonanza that March and April bring to our area is near. This is the turning point for me. Hunting season is over, the freezer is full, and the fly tying bench becomes more of an obsession than a place to sit and fool around with a what's just a "hobby" for some. This is a lifestyle! No matter how many thousands of dozens of flies I've tied, I just can't stop myself from getting after it on the stone flies I'll use this spring, and using lessons learned from last spring to come up with new patterns this time of year. The Montana Outdoor Journal is doing another article on my flies for their next spring issue, and I'll throw a link up for that one when it's available as well.